I am so happy with my farmhouse sink it's nice and deep . I looked around and overstock had the best price. Yes I can say I'm very happy with this purchase. I will keep ordering from them they always send everything so fast. The stainless, although for some too industrial, allows for an apron/farmhouse sink without the higher price of a fireclay product. For the average DIYer though, I feel the instructions that arrived with the sink could have offered more on how to install it, specifically a recommendation by the manufacturer on how to support the sink. We received a template, but the template did not correspond to our sink. It would have been nice if the sink had arrived with a plastic film, as most stainless does, to minimize the risk of any scratches during dry fitting, but we just taped our edges. Although not part of the Overstock description, I had read that all Kraus sinks arrived in/with a reusable cloth bag. This one did not. All said though, I am enjoying the sink and would recommend it. It was delivery really quickly and the packaging was great. I am so impressed with Kraus products that I am telling and showing everyone, my builder, plumber & friends. None of them had heard of Kraus before. One of my friends is now getting a Kraus sink and faucet. My builder and plumber were very impressed with the quality and price points. Very high quality Kraus sink. Very pleased with the choice. 33 inch sink will need at least 36 inch cabinet. Some customization to the cabinet will be required. This sink is fantastic quality. It is one of my favorite parts of our kitchen renovation. It is well insulated and quiet. I love having the 40/60 split, and I liked the additional accessories such as various sink strainers to suit your needs. I highly recommend. Beautiful well-made farmhouse sink! Looks great in out kitchen! 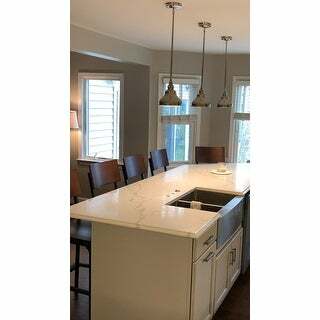 Contractor had to build a support in the island to support the weight of the sink but overall it was an easy install. Looks beautiful and it is very easy to keep clean. We have received so many compliments. The racks are also easy to clean. I am very happy that I convinced the builder to install it. He initially has his reservation, but once it was installed, he agreed that I made a good decision. We love this sink! I purchased it for a home I am building and it arrived in perfect condition and now that it is installed, it is just beautiful. Returned this sink it did not fit the cabinet. "How far down does the apron come? My contractor said many of the farmhouse sinks come down too far and interfere with the cabinet doors"
This item is approximately 46.2 pounds. Because it was one of the few Farmhouse sinks that had the small bowl on the left. The price was reasonable and the reviews were good. I want my dream kitchen and the Farmhouse sink is a of the dream. Can’t wait have it install. "is this an over mount sink or under mount sink"
Hello guymor, this item features 3 Mounting Options: Undermount, Flushmount & Topmount. Thank you for shopping with us. "We have a very tight space, love this sink, but would like our plumber and cabinet maker look at the installation instructions before we commit, where might I be able to get a copy? Debbie"
Hello djmc1, you will be contacted by Customer Care. Have a great day. 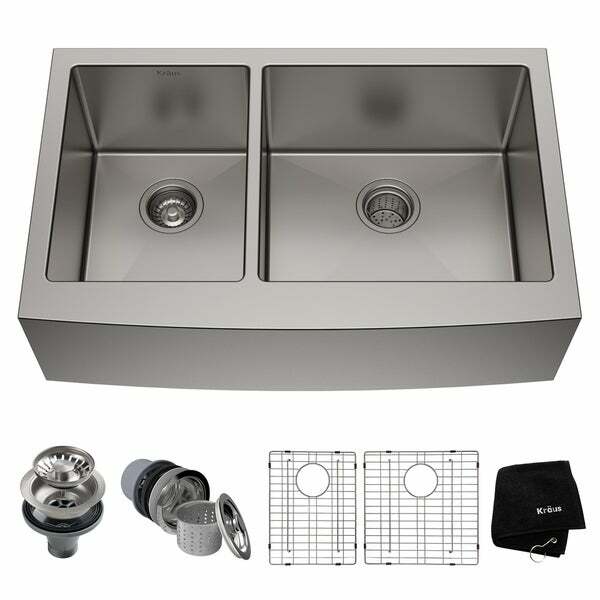 "Product info states the this sink can be installed in a 33" sink base. Do you have installation instructions? And where might I find them." Hello JulieF, I am attaching a link to the installation PDF. I hope this helps! http://www.kraususa.com/pdf/khf-204-33.pdf Thank you for shopping with us! A.S.
"Which side has garbage disposal hole?"